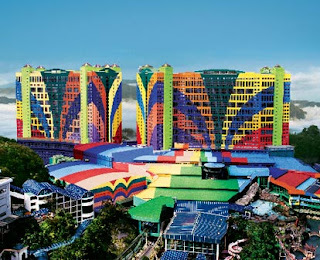 The First World Hotel, part of the First World Complex completed in 2001, is Malaysia’s biggest, with 4,300 rooms, offering comfortable and affordable accommodation. Awaiting guests at the hotel is a grand tropical rainforest themed lobby. Checking in will never be a problem with Malaysia’s first computerised queue system to expedite check-ins at its 32 counters. The hotel will have additional 2,000 guest rooms come on completion of the hotel’s second block. When fully completed by 2005, First World Hotel will have a total of 6,300 rooms, making it the world’s biggest hotel. The First World Café, the hotel’s coffee house, is also Malaysia’s largest, in keeping with the general character of the First World. It covers an area of 44,600 sq feet and can seat up to 1,338 guests. Guests at the First World Hotel will have easy access to the adjoining First World Plaza which houses a new-age indoor theme park with many exciting rides for the whole family and over 90 retail stores and food and beverage outlets.